CAYLUS, Anne Claude Philippe Comte de. 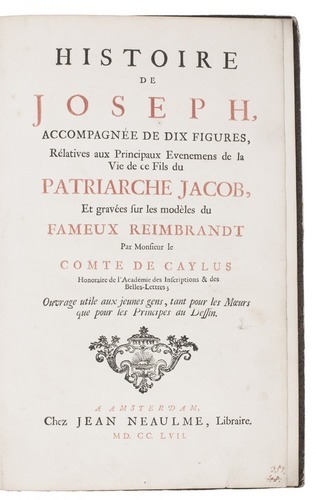 Histoire de Joseph, accompagnée de dix figures, rélatives aux principaux evenemens de la fils de ce fils du patriarche Jacob, et gravées sur les modèles du fameux Reimbrandt. Amsterdam, Jean Neaulme, 1757. Folio. 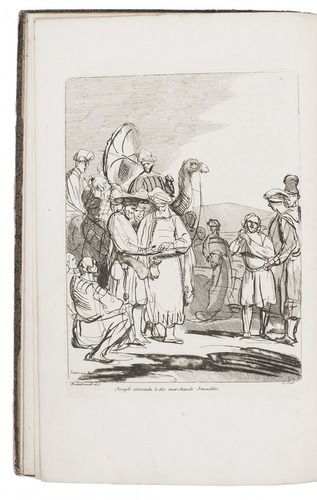 With title-page printed in red and black, and 10 full-page etched plates. Contemporary boards. 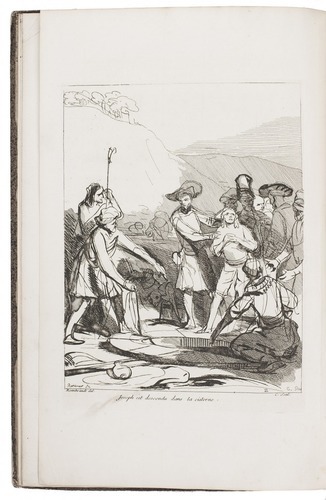 First and only edition of a children's book beautifully illustrating the biblical story of Joseph and intended "as much for the improvement of morals as for the principles of drawing", as the title-page notes. Anne-Claude-Philippe comte de Caylus aimed to inspire his readers with a love of virtue and an appreciation of Rembrandt's masterly and evocative drawings. The original drawings have been in the Louvre since 1842, but they have lost their attribution to Rembrandt and are now sometimes ascribed to Rembrandt's pupil Gerbrand van den Eeckhout. 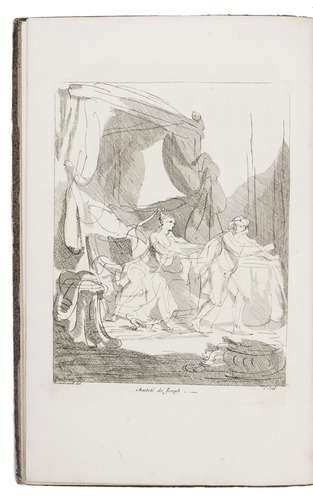 The first recorded owner of the drawings was the painter Charles-Antoine Joseph Coypel, an acquaintance of the author. 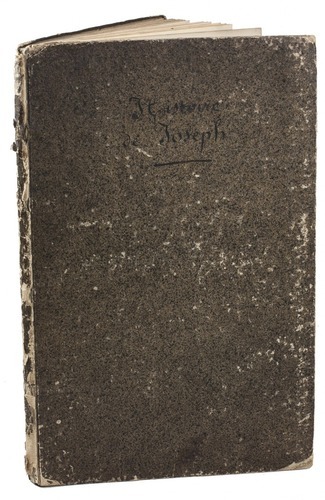 Owner's inscription on paste-down, binding chafed, spine damaged. Otherwise in good condition. A fine series of 10 etchings. Cohen-de Ricci 210; STCN (4 copies); for Caylus: Lugt, Marques des Collections 2919.